One of the most frequently asked questions about Szechenyi Spa Baths is whether children (teens, kids, toddlers, babies) can go to Szechenyi Baths. The short answer is that children over 14 years old can go to the baths, under 14 the pools are not recommended for kids, but if the parents decide to come anyway at their own responsibility, they can. However, children & babies who are not dry and clean yet (being potty trained) are not allowed in the pools, not even with a swimming nappy. This usually applies to children under 3 years of age. Babies and toddlers can come with you to the bath, and stay outside the pool area. 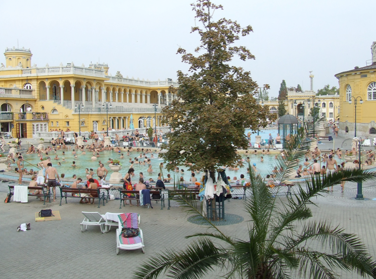 In 1913, when Szechenyi Bath was opened, the whole bath complex was, and is still aimed at adult bathers, so we recommend families with children visiting one of the open air lidos in Budapest, especially Palatinus Pools on Margaret Island and Dagaly Lido close to Arpad Bridge (north of Margaret Island). 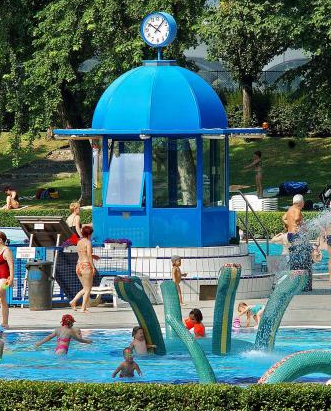 Both of these Budapest pool parks (lidos) are within easy reach of the city center, and have lots of fun pools designed specifically for children, plus there are various baths with thermal water for parents too. 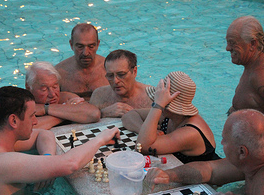 So you can enjoy the famous natural spring waters of Budapest without a compromise. Palatinus and Dagaly are also much loved by locals as the pools are surrounded by grassy, bushy green areas where you can play volleyball, Frisbee, the children can run around, etc. As a contrast, at Szechenyi Baths there are no slides, or very shallow toddler pools , nor is it allowed to throw balls in the pools. In addition, the area of the pool side is not covered with grass but with stone panels. 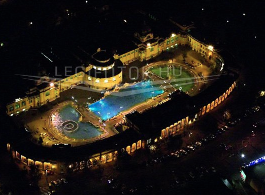 While we think of Szechenyi Spa Baths as a truly fun place, the baths, saunas, and pools have been primarily designed for men and women and of course, for patients who have been prescribed aqua therapy, balneotherapy, etc. for some kind of medical condition (hospital patients are treated in the special pools, which can only be used by hospital patients – in our Szechenyi Spa Baths map indicated with green color, saying ‘Hospital Pool’). 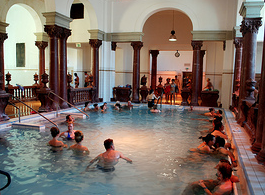 As a rule of thumb, kids under 14 are prohibited to use the thermal baths, while children over 14 can use the thermal baths for a limited time. Most teens and adults at Szechenyi Baths enjoy the outdoor whirlpool with its fun whirls, sweeping you off your feet in a circular motion. You can also visit Szechenyi Baths for a short bath tour (without soaking in the baths, just to take a look around) for a modest price. Please check our price list for Szechenyi Spa Baths. Hi I have a 3 year old kid, will she be able to go in all the pools accompanied by an adult? bathing in the hot thermal water is not recommended for children under 14, but if the parents decide to come anyway at their own responsibility, they can. Unfortunately, there is no children price in Szechenyi Baths. 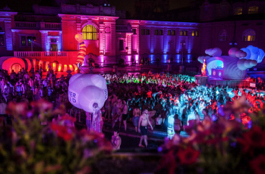 I am 2 months shy of my 18th birthday, my uncle has purchased DUO express tickets to the Sparty at Szechneyi Baths, do you think I will have a problem getting in? Hiya, i’m travelling to Budapest in August and i am bringing my grandaughter. Please could you tell me what age you need to be to have a massage? Many thanks. 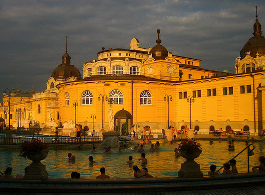 The minimum age for getting a massage in Szechenyi Baths is 18. Me and my husband travelling to Budapest in mid September and would like to visit Szechenyi Bath. We have a toddler who is close to 3 yrs of age. Can he accompany us to the baths? He is fully toilet trained and if he is allowed is there any entry fee for under 3 yrs old ? yes, children are allowed in the Baths, but unfortunately there is no special children price. I’m afraid you will need to buy him a full day bath entry. My husband and I will be travelling to Budapest in March with our 2 kids (ages 7 and 3). If our kids only accompany us and do not enter any baths, will we still have to take the full priced tickets for them? yes, I’m afraid you will still need to buy a normal bath entry for the children too. Thank you for your understanding.